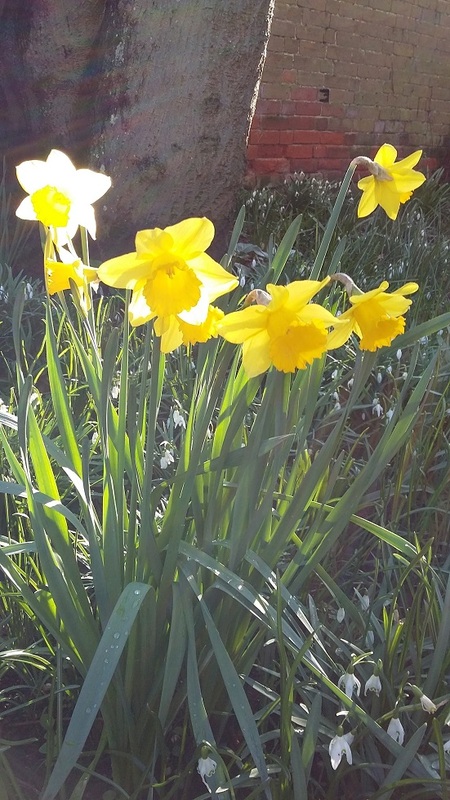 Recently with all the brilliant blue skies and crisp cold sunshine, I managed to get out into the garden to do some clearing up. I live in hope that if I can do some weeding now, it will stand me in good stead later in the year. Apart from anything else, it’s a lot easier to get at the weeds before the main plants explode into growth. 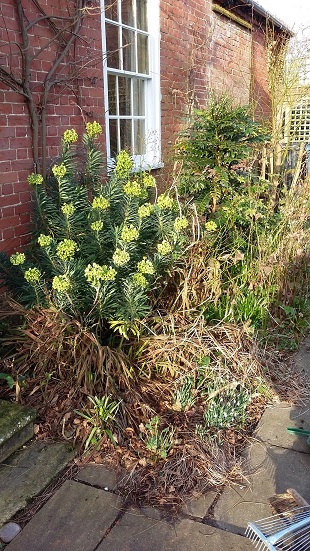 I started off on one side of the front door, keen to remove some of the dead leaves, and let the bulbs underneath grow up. 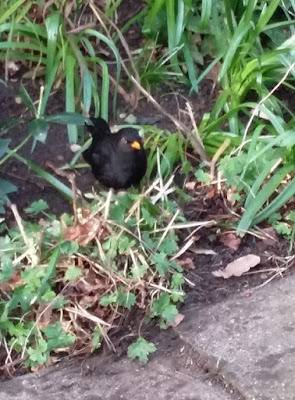 While I was working, a cheeky blackbird came to chance his arm at any worms uncovered during the digging. He was so tame that he’d perch only a foot away from me, occasionally fluttering away if I moved suddenly, but always returning. 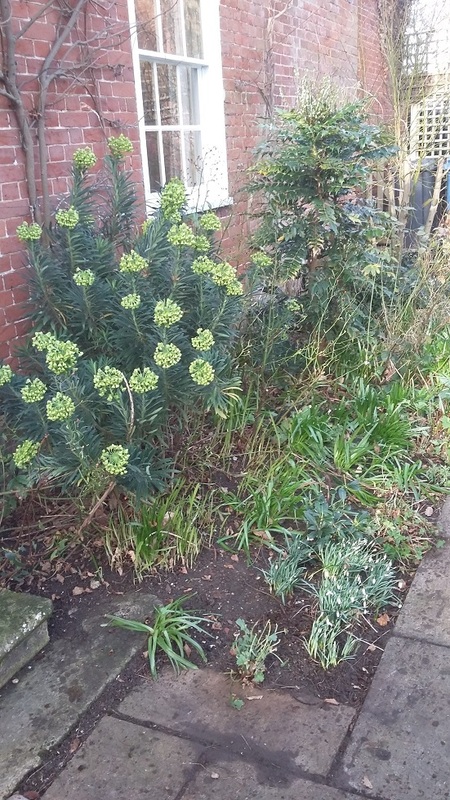 After the hacking back, pruning, deadheading and digging out, the flower bed did look a bit better. Even turns out there were quite a few primroses and snowdrops underneath everything else! It didn’t feel like I’d cleared out particularly much, but it still seemed to fill a pretty big garden waste bag. 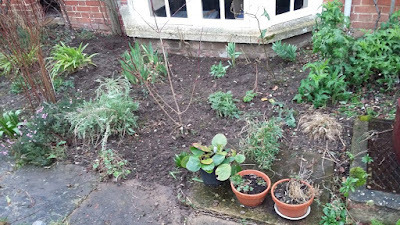 My sporadic efforts at gardening usually seem to be driven either by people coming to visit, or the garden waste removal once a fortnight, or a combination of both. In Hackney, the garden bin was emptied for free. Here in Suffolk, we have to pay the local authority £40 a year to empty a big wheelie bin of garden waste every other week. This tends to focus my mind on making sure they actually have something to remove! The next bed I tackled, a couple of weekends later, was in the back garden. This particular flower bed, next to the steps down from the back door, has been infiltrated by an army of grass, keen to annex the bed as another part of the lawn. The odd shard of roof tile is one of many clay tiles and red bricks I’ve heaved out of assorted flower beds here, there and everywhere. The pots at the front are perched on top of a large slab of York stone. 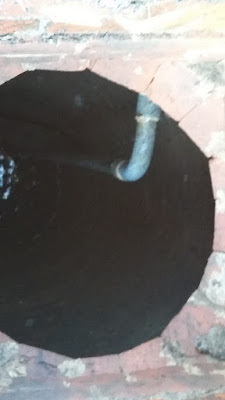 Underneath is the original Georgian well, with brickwork spiralling down to the water level. I’ve only seen it once (that slab is hefty) and took a couple of pretty rubbish photos, but this might give you some idea. with sunlight reflecting off the water right at the bottom. 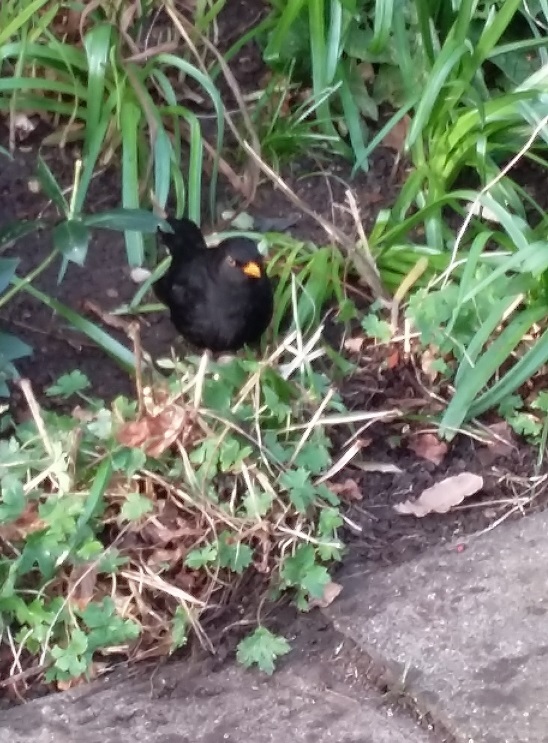 I was glad to see the blackbird back again, to supervise my attempts, and stock up on worms. Anyway after a sustained effort at removing grass and brambles, it was even possible to see some of the earth undeneath. Anyone else taking the chance to tidy up outside while the weather is bright and breezy? you did well, looks so much better already. My husband left his previous job to set up his own gardening business (am so proud of him), so he is out gardening every day. 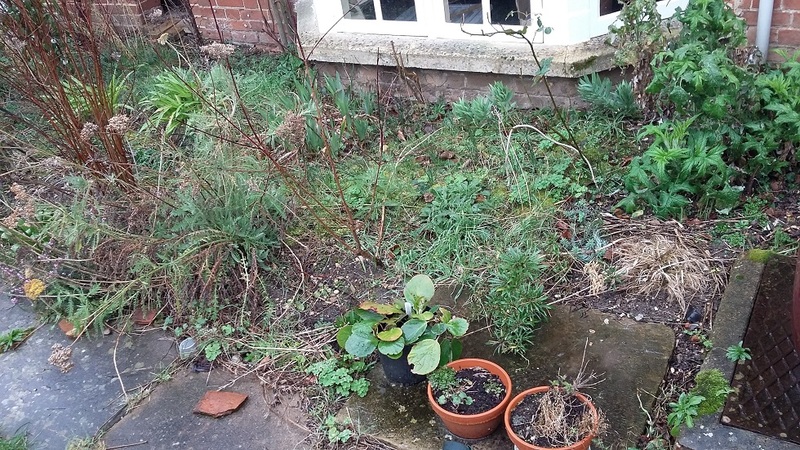 Our garden get a smidge neglected. But he's been refusing work on a Monday so he can get out and work here (I threatened to hire a beefy gardener! ), he goes into Violet's school in the afternoon to work in the teeny garden by their classroom. He's refreshed the raised beds, ready for veggies that he's starting from seed in the greenhouse, and I've decided I need some trellis and climbing plants on one fence that looks bare. And you are so right, the weather lately has been rather beautiful. I'm still dreaming of snow, because I'm not ready to say goodbye to winter, but no denying it, the days have been cold and glorious. 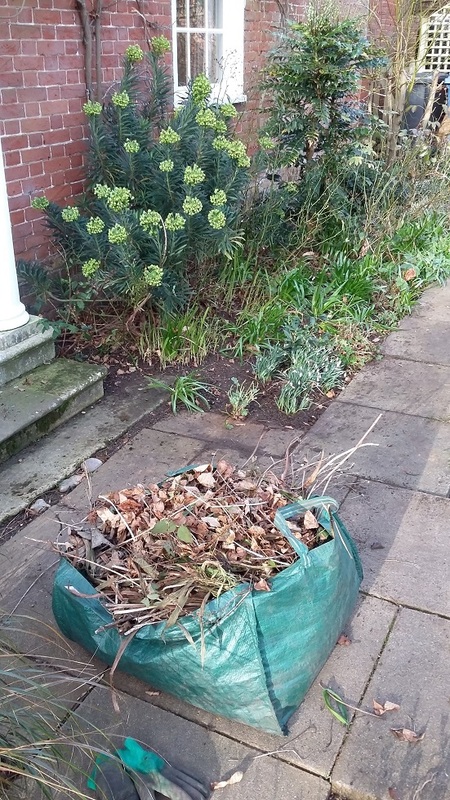 Any twigs go into a separate garden waste bag, to be dried and used as kindling, the rest goes into the compost. Voilà, no garden waste! Sounds like yet another good reason why I need to get my act together and create a compost heap! My husband is already very keen on scooping up wood for kindling in the log burner, so will recognise a kindred spirit.